Heads Up, Big Banks: the Divestment Movement is Coming for You. This post was authored by Harry Alper, a 2011 graduate of Washington University in St. Louis and organizer with Rainforest Action Network. Poor Brian Moynihan is going to have to hear about climate change for a long time, and while he may not have realized back in May, he was addressing representatives of the fastest growing segment of the U.S. climate movement: student divestment campaigners. Minutes after Moynihan asked to shut climate out of his shareholder meeting, a delegation of student climate activists delivered a stunning announcement: “We and students at 80 other colleges and universities have pledged to disrupt your recruitment sessions on our campuses until you commit to phasing out your loans to the coal industry.” Incredulous, Bank of America’s board members began to talk nervously amongst themselves; several turned around in their seats to stare down the students. UC Berkeley students outside Bank of America interviews Flash forward to October 2013, and it’s clear that the students weren’t kidding around; Bank of America has developed a major problem in on-campus recruitment across the country. Over the course of this fall semester, student climate activists and divestment campaigners have relentlessly targeted career fairs, interviews, and informational sessions organized by Bank of America and Citi, the two largest funders of the U.S. coal industry. It’s hardly surprising that a movement focused on eliminating financial support for the fossil fuel industry would find an adversary in Wall Street; Bank of America and Citi pumped a combined $263 billion into fossil fuel companies since 2010. Student opposition to this lending is off to a ferocious start: at the time of this writing, students on more than twenty campuses have mobilized to bring the climate crises to the banks, and the divestment movement has made its power felt at nearly thirty campus recruitment events since September. This effort represents a significant expansion in the power and sophistication of student divestment networks. By coordinating sustained action across campuses and over several weeks, divestment activists are exploring new avenues to power, and uniting their local brush fires into a formidable blaze that is licking at Wall Street’s credibility. Sign up here to join the effort and put Bank of America and Citi on notice. 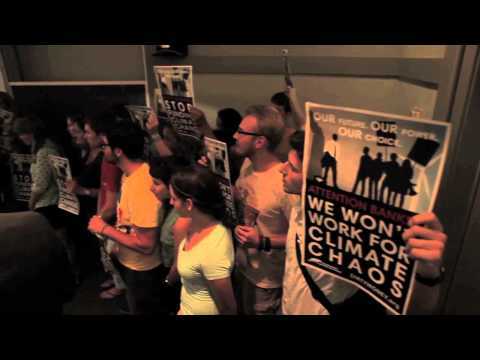 On the eve of Power Shift 2013, where 10,000 student climate activists will gather in Pittsburgh to strategize and compare notes, Bank of America and Citi would be wise to move quickly to sever their financial relationships with big coal. Campus outrage over fossil fuel funding is growing, and banks ignore or underestimate the divestment movement at their own peril. Take heed fossil fuel funding banks: you’ve been warned.